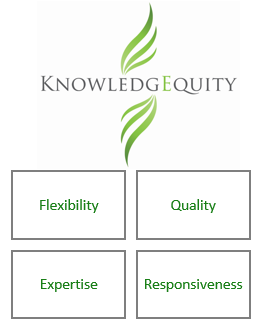 KnowledgEquity is an Australian-based company, founded in 2006 by Courtney and Russell Clowes. We have a global reach, providing education, training and consulting services in accounting and business management. We pride ourselves on the quality of our products and services using our expertise to tailor outcomes to meet our clients’ needs. We are passionate about education and understand that people want to challenge themselves to improve their knowledge and develop their career. KnowledgEquity has developed and presented a range of educational and learning products, from ‘Accounting for non-accountants’ and ‘Financial acumen’ courses, to Professional program study materials and support, to Continuing professional development (CPD) for professional accountants. Inspired by our founders’ passion for engaging and exciting teaching styles, we recently created online support tools for the CPA Program®, aiming to provide tailored learning journeys so each candidate can reach their full potential. Our co-founder, Russell Clowes, was the winner of the CPA High Achievers Award, with the highest mark in six segments of the CPA Program and Courtney Clowes has authored or updated a number of modules of the CPA Program. We have now built a team of CPAs who achieved exceptional performance in the CPA Program, so they know what it takes to do well. KnowledgEquity also has an established consultancy business providing clients with measurable results through improved business performance including strategic acquisitions, cash flow management, cost control and process redesign. Meet our dedicated team by viewing their Profiles.